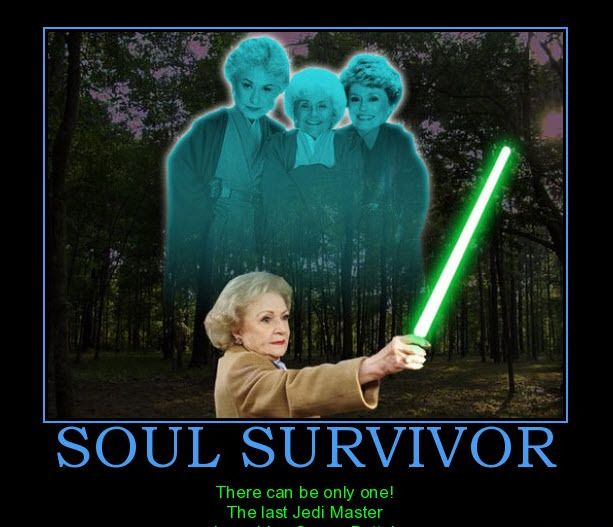 Betty White! The last Jedi master!! Since when did Jedi go by Highlander rules? No, even after he sold out there was always master and apprentice. Exactly. This is completely off the mark and by existing has damaged us all as a race. Though, to fit this, I suspect Autumn Reeser and Rachel Bilson will kill off Mischa Barton, Willa Holland and the other girls from The OC then have a final showdown with the winner becoming Betty’s apprentice. Ain’t it supposed to be Sole Survivor in any case?